The first Russian incarnation of the giant German digital business expo CEBIT will take place at the Skolkovo Technopark next year after the technopark signed a cooperation agreement with Deutsche Messe Rus, the Russian arm of the event’s organizer. 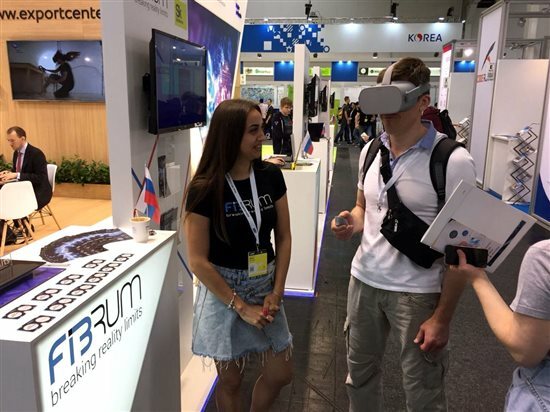 Skolkovo virtual reality resident Fibrum is showcasing its Desirium platform at CEBIT 2018. Photo: Sk.ru. The agreement was signed in the German city of Hanover, where CEBIT 2018 opened on Monday, running through June 15. The first CEBIT Russia will take place on March 19-21, 2019 at the Skolkovo Technopark, and will cover the same topics as its German namesake, such as the Internet of Things, artificial intelligence, blockchain, mobile solutions, security solutions and drones. “The first CEBIT Russia will take place in the Skolkovo Technopark, and it couldn’t be any other way: our space and its atmosphere coincide fully with the ideology of this major tech exhibition,” said Renat Batyrov, general director of the Technopark. “International IT companies have a great interest in the Russian market, which makes CEBIT Russia an optimal platform for lead generation and technological exchange – especially for motivated IT startups,” Deutsche Messe wrote in a press release. Meanwhile, nine Skolkovo startups are currently taking part in CEBIT 2018 in Hanover, which is showcasing nearly 3,000 products from about 70 countries. The Skolkovo tech startups are exhibiting at a Made in Russia stand organised by the Russian Export Centre, and include several companies working in the field of virtual and augmented reality (VR/AR). Tau Tracker makes gloves for use in VR that accurately track the wearer's hand movements. Photo: Sk.ru. Alt is showing its full-body inside-out tracking for use in virtual reality for the first time, while fellow virtual reality company Fibrum is showcasing its Desirium product: a single platform that allows users to immerse themselves in a range of virtual reality experiences. Desirium can be used with headsets including Oculus Go, HTC Focus, Samsung GearVR and others. 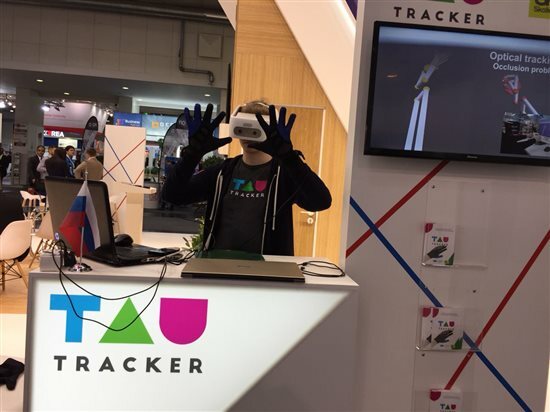 Another Skolkovo VR resident, Tau Tracker, has taken its VR gloves, which allows the accurate interaction of hands in VR, to CEBIT, while Immergity is demonstrating its technology for creating interior and housing showrooms for use in house sales and interior design. “All of our companies [taking part in CEBIT] are working in the deep technology sector, which is highly rated and closely watched by international experts, including the field of interactive technology in virtual reality,” said Alexei Kalenchuk, head of VR and AR and gamification technology at the Skolkovo Foundation. “We’re moving towards solutions getting cheaper and simpler, so ordinary users and small businesses can afford them,” he added. Other Skolkovo resident startups taking part in CEBIT this year include Symway, with its peer to peer unified communications system, and Rightech IoT Cloud, a real-time IoT cloud platform that serves as a universal framework for building IoT applications.